Though I have special place for all American craft gin, I do hold a special place in my heart for gins from the agricultural farmlands and vast wine countries of upstate New York where I grew up. Myers Farm hails from Finger Lakes Wine Country, only a little up the road from another Gin is In favorite, Finger Lakes Distilling’s Seneca Drums. Though both hail from the contemporary gin tradition, Myers Farm Gin stands on its own as a great example of modern gin distilling and grain-to-glass philosophy. Very contemporary on the nose, quite sweet. Myers Farm Gin brings clove, cinnamon, lavender. A complex but inviting bouquet of contemporary aromas. A hint of citrus as well. An almost carmelized sweetness on the palate of Myers Farm Gin captures your attention. Intense and vivid, a bit spicy with some strong floral hints too. I quite early on recognized that this particular bouquet worked swimmingly in a martini. That was among my favorite cocktails to enjoy this in. Then I found, the gin and tonic tended to shift the notes with emphasis towards the finish. It tasted perhaps less contemporary in this arrangement, though there were still pronounced floral notes, with citrus and juniper. The Negroni came out equally as well. I found the notes to be subtle but present. A rich almost fruitcake sweetness, with a touch of citrus on the close. Well balanced and highly recommended. Though I’m not the biggest proponent of the gimlet, I thought this was actually an example of one of the best drinks it put together. Well balanced, floral and lime cordial perfection. Along these same lines, I thought the Tom Collins and Gin Fizz were equally worth noting. I found this to be one of my favorite contemporary styled gins I’ve had in quite some while. Well balanced with a complex taste, but one that works successfully in an array of cocktails. 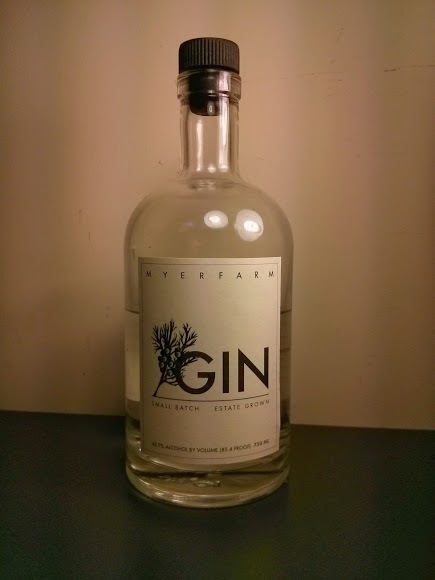 If you’re looking for well made contemporary gin that has a challenging taste, that has florals but doesn’t end on the same note, I think you’ll find Myers Farm a worthy addition to your bar.